Just search for SIS-PMS and you will find it. I will just show a few images showing what you need to to setup in the Silvershield Power manager. Above you see the main window of the program you use on a PC to control the Silvershield. When you see the settings screen press "Device sharing" button. Here click the "Share this device via network", and type the password you want to use when connecting from other PC's or from Android. Remember the "Device name" and Password, we are going to use it later, when we setup the Android SilverShield Control. 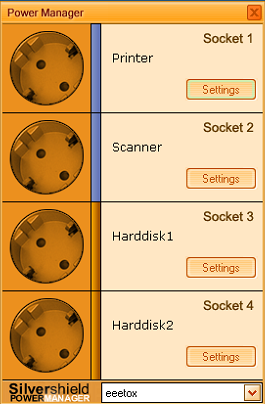 The devicename here is "eeetox", you can set it yourself by pressing "Rename" and choose "Device".